We present a second-generation wastewater treatment inventory model, WW LCI 2.0, which on many fronts represents considerable advances compared to its previous version WW LCI 1.0. 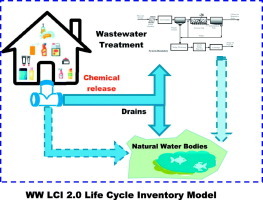 WW LCI 2.0 is a novel and complete wastewater inventory model integrating WW LCI 1.0, i.e. a complete life cycle inventory, including infrastructure requirement, energy consumption and auxiliary materials applied for the treatment of wastewater and disposal of sludge and SewageLCI, i.e. fate modelling of chemicals released to the sewer. The model is expanded to account for different wastewater treatment levels, i.e. primary, secondary and tertiary treatment, independent treatment by septic tanks and also direct discharge to natural waters. Sludge disposal by means of composting is added as a new option. The model also includes a database containing statistics on wastewater treatment levels and sludge disposal patterns in 56 countries. The application of the new model is demonstrated using five chemicals assumed discharged to wastewater systems in four different countries. WW LCI 2.0 model results shows that chemicals such as diethylenetriamine penta (methylene phosphonic acid) (DTPMP) and Diclofenac, exhibit lower climate change (CC) and freshwater ecotoxicity (FET) burdens upon wastewater treatment compared to direct discharge in all country scenarios. Results for Ibuprofen and Acetaminophen (more readily degradable) show that the CC burden depends on the country-specific levels of wastewater treatment. Higher treatment levels lead to lower CC and FET burden compared to direct discharge. WW LCI 2.0 makes it possible to generate complete detailed life cycle inventories and fate analyses for chemicals released to wastewater systems. Our test of the WW LCI 2.0 model with five chemicals illustrates how the model can provide substantially different outcomes, compared to conventional wastewater inventory models, making the inventory dependent upon the atomic composition of the molecules undergoing treatment as well as the country specific wastewater treatment levels.